The one that started it all, our signature Tate’s chocolate chip cookie is just as delicious as it was back when our bake shop first opened in Southampton, NY in 2000. 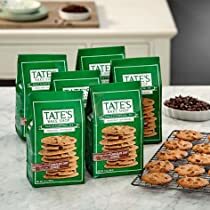 Crisp, buttery, and unforgettable, you’ll know with just one bite why these delectable treats were voted the #1 chocolate chip cookie in America. Yum!